How To Be A FUN Wedding MC covers MC Duties in much more detail and includes the reception timeline, games for the reception, reception agenda or run sheet samples, reception timeline, MC scripts, and much, much more. Your first task is to meet with the planners to find out what is expected from you and to get information about the reception. Our FUN MC Guide not only shows the “rookie” MC what to do and what to say but also provides a list of questions to ask the planners. The background information you obtain on the bride and groom will help you with remarks you make during the reception. How To Be A FUN Wedding MC has a list of questions to ask the bride and groom as well as the bridal party to help with the introductions and the Grand Entrance. 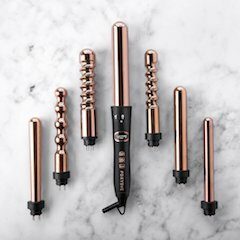 Your material will consist of background information on the bridal couple and those who will be giving speeches and toasts, amusing stories, and other details of the reception. Ensure room set up and decorations are scheduled to be completed well before the guests arrive. 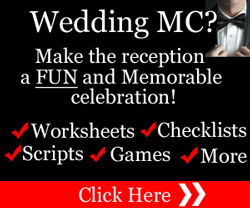 How To Be A FUN Wedding MC has a comprehensive checklist for the reception venue – for both indoor and outdoor receptions. Make sure your suit, tuxedo, or dress, and shirt or blouse are clean and pressed and your shoes are shined. This includes your checklists and notes, pens, name tag, personal hygiene items, watch, and items required for audience participation games. 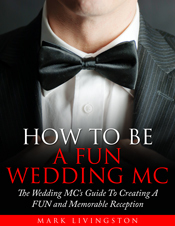 We’ve now included How To Be A FUN Wedding MC on our list of highly recommended guides every Master of Ceremonies should have to help plan a fun and memorable reception. It’s specifically written for the first-time or novice MC who doesn’t know where to start or how to plan a FUN reception and is filled with checklists, preparation forms, order of reception events, examples of reception runsheets, word-for-word MC Scripts, and much, much more. 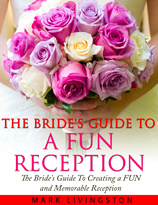 Click the following link to find out more about how this comprehensive Guide can help you create a FUN reception.